Fysical Labs makes it easy for you to add a revenue stream from your mobile users without affecting the user experience. The purpose of this introduction is to provide you with an overview of the BeaconsInSpace SDK and the services we provide. REST API: our core API that generates beacon detections from your users. The easiest way to use the API is via our iOS SDK or Android SDK. Mission Control: our cloud dashboard for you to view your earnings, access your API key, view location analytics, and integrate with third-party platforms and APIs. The cloud dashboard and the API work in tandem. You can start earning revenue in minutes when you sign up. The SDK for iOS makes it easy for you to start earning revenue from your users' location data points. We built the SDK on Apple Core Location and it currently supports iBeacon. The guide below will get you setup with full functionality in 5 minutes. BeaconsInSpace uses Cocoapods for installs. If you would like to manually install our SDK please download the latest version. Note: For manual installs, after you have added the BeaconsInSpace.framework to your Xcode project, you must navigate to Build Settings > Linking > Other Linker Flags and add "-ObjC". Signup for a free account to get your API Key in Mission Control. 1 iPhone (4S or newer) or iPad (3rd gen. or newer) with iOS 7+, to run your app. 1 Mac computer with Xcode. Note: BeaconsInSpace does not require location background modes, CoreBluetooth, or a Bluetooth permission prompt for the end user. Unless you are using location background modes or CoreBluetooth for a different reason, please do not include them when submitting to the store. To run the CocoaPod, open your terminal and navigate to your apps Xcode project. This sets up the beaconManager, which will automatically connect you with your test beacons and subscription beacons with BeaconsInSpace. BeaconsInSpace uses foreground and background location monitoring to detect when users are near a beacon. In order to use location services, go to the info.plist and put in the Key "NSLocationAlwaysUsageDescription" and "NSLocationAlwaysAndWhenInUseUsageDescription" and "NSLocationWhenInUseUsageDescription", and for the String Values enter the message you'd like to display to users when asking for their location. The BeaconsInSpace beaconManager will handle asking for permission once this is set. You can confirm the SDK has been initialized successfully by viewing "The BeaconsInSpace SDK has been initialized." in the development environment logs. If you see this line of text, you are all set and ready for Step 6. Before you submit your app, please make sure to include the AdSupport.framework in your project. The BeaconsInSpace SDK requires this framework in order to run properly. 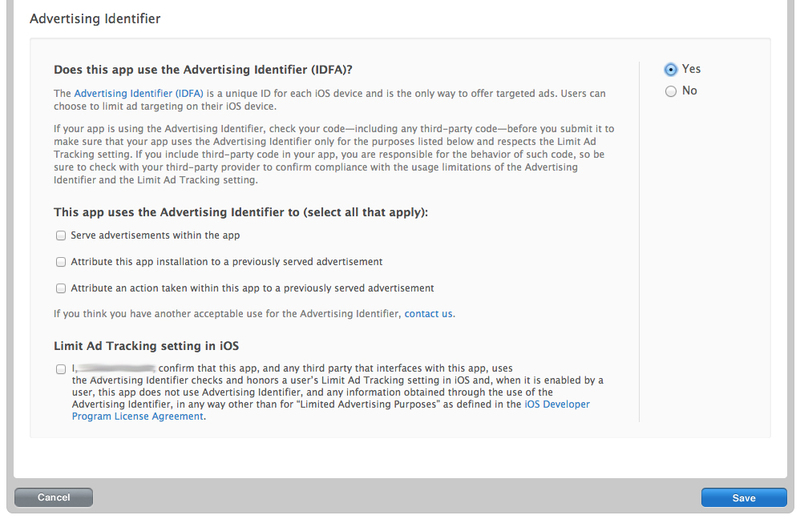 Note: please do not check the box labeled ““Serve advertisements within the app” unless you display ads or already have a standard process of checking this box and collecting the IDFA. Sample: We share data we collect about you including unique identification numbers associated with mobile devices or through its API (including, for example, a Unique ID for Advertisers ("IDFA"), Unique ID for Vendors ("IDFV"), Google Ad ID, or Windows Advertising ID), mobile carrier, device processes, device type, model and manufacturer, mobile device operating system brand and model, device name, battery life, and, depending on the user’s mobile device settings, the geographical location data, including GPS coordinates (e.g. latitude and/or longitude) or similar information regarding the location of the mobile device (“User Data”) with our third party partners, that enables us to provide you with information, advertisements, or offers specific to your location and interests. By accepting our terms of service, you consent to the collection, storage and processing of your data by our third party partners for the purposes of: (i) providing or improving their services; (ii) enabling third parties to assist us and the retailer and venues (in which the beacons are located) in better serving and understanding our users; and (iii) sharing your data with third parties so they can provide or enable the provision of content, offers or other marketing solutions that may be of interest to you. You also consent to having your data transferred to and processed in the United States or any other jurisdiction in which our third party partners or their parent, subsidiaries, affiliates, service providers or partners maintain facilities. If you do not consent to the collection and transfer of the aforementioned data through the identification of your mobile device, we recommend that you: (a) delete our app or adjust the in-app settings of the app; or (b) opt out of sharing your mobile advertiser ID by limiting ad tracking on the device. For iOS, navigate to your Settings > Select Privacy > Select Advertising > Enable the “Limit Ad Tracking” setting. For Android, open your Google Settings app > Ads > Enable “Opt out of interest-based advertising. For more information on specific opt-out choices, please visit: http://www.networkadvertising.org/mobile-choices. The BeaconsInSpace SDK for Android makes it easy for you to start earning revenue from your users' location data points. 1 mobile device with Android 15+. 1 computer running Android Studio or equivalent development environment. Below are the instructions to use jCenter to add the SDK to our project. If you would like to install the AAR, see below. Note: If you prefer to use a different version of google play services, it must be version 11.0.0 or higher, and it must include the play-services-ads and play-services-location modules. In Android 6.0+ devices location permissions are required. BeaconsInSpace uses location to detect beacons. Next, in the onCreate method, we’ll import the SDK and call the static configure method. This method can and should be called each time the application initializes. In order to confirm that you have correctly implemented the SDK, you should view the development environment logs and look for "BeaconsInSpace has bootstrapped successfully.". If you see this line of text, you are all set and ready to submit! Below is an example of your activity without the optional delegate added. Don't forget to replace “YOUR_API_KEY_HERE" with your API Key. Below is an example of your activity including the optional delegate. Don't forget to replace “YOUR_API_KEY_HERE" with your API Key. We also recommend sending questions and feedback via the small chat bubble in the bottom right corner of this page. We usually get back to you within 30 minutes.